HENLEY HIGH GLOSS DINING RANGE. PORTO RECLAIMED IRON & WOOD. 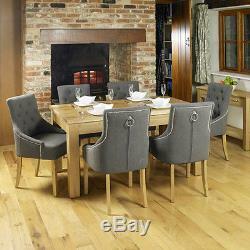 Dining Table & Chairs Sets. Dressers & Buffet - Hutch. 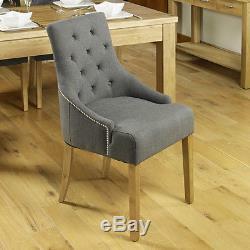 Oban Oak Wooden Furniture Accent Upholstered Dining Chairs GREY STONE PAIR. Oban Oak Range Furniture is handcrafted from solid oak timbers and oak veneers. Its exceptional build quality is designed to last a lifetime. All items in this beautiful range have a Resilient Satin Lacquer Finish which is hardwearing and emphasises the stunning Light Oak colour. 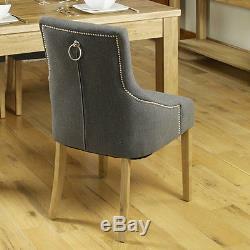 Oban Oak Pair of Accent Upholstered Dining Chairs. Made from Solid Oak Timbers. 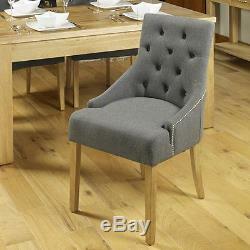 Upholstered Grade A Hardwearing Stone Grey Fabric. British Standards Approved and Fire Retardant. Oban Oak Furniture Range provides a wide range of items for your Living and Dining room, such as Bookcases, Dining Tables and Chairs, Coffee Tables, TV Units, Sideboards, Shoe Racks and many more. OTHER ITEMS IN THE RANGE. Oban Oak Wooden Furniture CD DVD Entertainment LCD Plasma TV Shelves with Drawer. Oban Oak Wooden Furniture Media CD DVD Entertainment Shelf Storage Tower Stand. Oban Oak Wooden Furniture Widescreen LCD Plasma TV Cabinet with Drawer Unit. Oban Oak Wooden Furniture Large Tall Bookcase Bookshelf Storage Display Shelves. Oban Oak Wooden Furniture Shoe Rack Cabinet Storage Cupboard Shelf with 2 Door. Oban Oak Wooden Living Room Furniture Medium Rectangular Coffee Table Low Shelf. 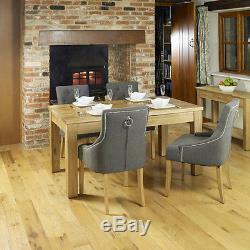 Oban Oak Wooden Kitchen Dining Furniture 4 Seater Rectangular Dining Table. Oban Oak Wooden Furniture Widescreen Plasma TV Corner Cabinet Stand Unit. Oban Oak Wooden Dining Room Furniture 2 Door Sideboard Cabinet with 3 Drawers. Oban Oak Wooden Furniture Widescreen Plasma TV Open Shelf Cabinet Stand Unit. Oban Oak Wooden Living Room Furniture Lamp End Side Table with Drawer Low Shelf. 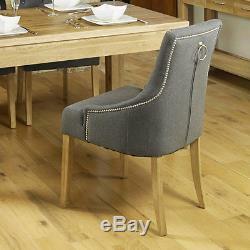 Oban Oak Wooden Dining Room Furniture Upholstered Dining Chairs PAIR. 4 CHEQUES / POSTAL ORDERS: Please make all cheques/PO payable to SWJ UK Ltd. Unfortunately not all items are available for next day. If there is a delay we will notify you ASAP. Deliveries are booked in 2-3 days prior so you will know when your goods will arrive. Surcharge Areas, Scotland & Wales Postcodes Depending on the order size we can waive this off for you. For the following postcodes-IV, DD, PA, AB, KW, EH, DG, FK, G, KA 1-26, 29, 30, KY, ML, PA 1-19, PH, TD, LL, LD, SY16-20, 23-25, SA. CF, NP, Northern and Southern Ireland, Isle of Man, Isle of. Channel Islands and Scottish Isles an additional charge may apply. Carrying each item into the room of choice up the stairs etc. Please notify us if you prefer this service, we can quote you the price. Full Installation , position the item into the room of choice. Please notify us if you prefer this service and we can quote you the price. This is important and ensures you are happy with our terms. We want your shopping experience to be a happy one and wish to avoid any complications later on. This may sound obvious, but unfortunately this does happen occasionally. We will try our level best to resolve the problem to your satisfaction. Faulty Items : We do our best to ensure our products reach you in perfect condition. 3 The Item is complete. 4 We are notified within 14 days. 4 We are notified within 30 days. Milan rattan outdoor garden furniture. Clifton solid oak bedroom furniture. The item "Oban Oak Wooden Furniture Accent Upholstered Dining Chairs GREY STONE PAIR" is in sale since Monday, September 26, 2016. This item is in the category "Home, Furniture & DIY\Furniture\Chairs". The seller is "fusion-furniture-store" and is located in GB. This item can be shipped to United Kingdom.